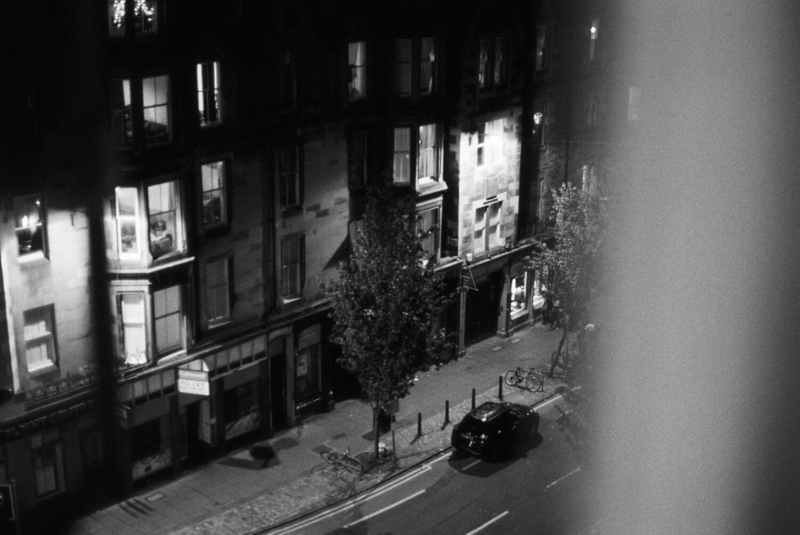 The home of Scottish film photographer Steven Anderson. A few weeks ago I grabbed my recently purchased Canon AE-1 Program and shot my first roll of film. I did so at my Dad’s work, Edinburgh University. Through chance, the Head of Anatomy at the university had saw my Dad carrying a camera he had picked up for me at a charity shop. My Dad explained that it was for me and the Head of Anatomy suggested that I come up and take some photos. So the following Sunday night my Dad and I were free to roam the majority of the Anatomy buildings by ourselves. I was unsure whether to shoot film or not since the lighting was going to be challenging for the type of shots I wanted to take and barring basic point and shoots and the odd disposable in my youth, I had never shot film before. Nonetheless I stuffed my AE-1 into my bag along with my Canon 5D Mark II just in case and I'm glad that I did. I ended up shooting both film and digital as, quite frankly, I thought there was a very high chance I'd load the film wrong, or that the pictures would be totally unusable. Thankfully that wasn't the case and the scans I received from the lab turned out way better than I expected. 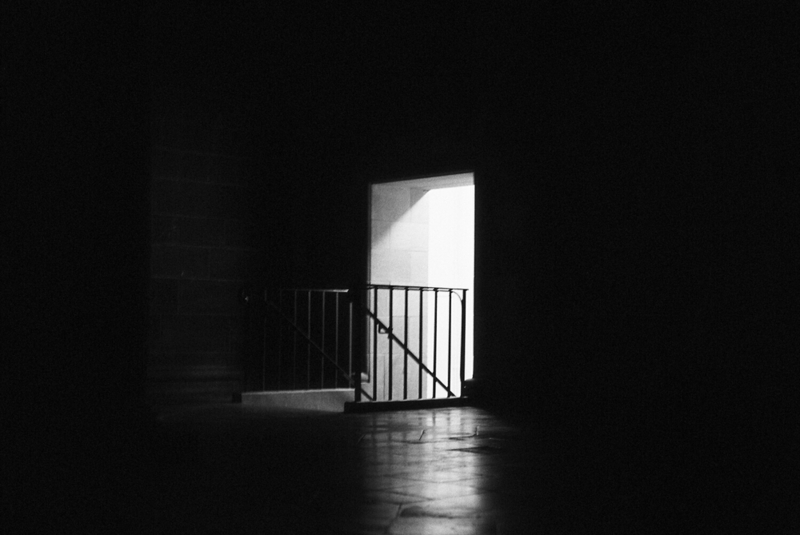 Ilford HP5+ really delivered the look that I had in my head and this post will contain a mix of shots from that night, both film and digital. Hopefully you like them. All in all it was a successful trip and long overdue since circumstances meant I hadn't been out to take pictures for over a year. I had to get by posting old stuff and the odd photo taken at home. It’s nice to finally have new stuff to share. Edinburgh University’s Anatomy Lecture Theatre, which dates from 1884, is a very striking room. Its steep, tightly packed rows of seats gave students a great vantage point of the small teaching area where live dissections of human cadavers once took place. These days it serves as a normal lecture theatre and I'm led to believe that it's rare for the public to gain access to it. Therefore, I did my best with the short time that I had to try capture both its architecture and its mood from a different perspective to that of the handful of photos that already exist online. This is the second shot of the Anatomy Lecture Theatre that I felt showcased it differently from how others have. The ceiling of the room, with its curves and beams, is really quite lovely. Even more so with only the back row of lights illuminating it. A nice little staircase just outside of the lecture theatre. I loved the way the light emanated from this little passageway. The Anatomy Museum's lobby has a few exhibits of its own, with the most eye-catching being the two imposing elephant skeletons that sit either side of the main doorway. A closer view of the lobby's other elephant skeleton. Some of the lobby's other exhibits include busts, statues, death masks, paintings and a whale's jawbone. Quite an impressive collection to view before entering the museum itself. This shot shows some of the aforementioned, including a replica of Rembrandt’s "The Anatomy Lesson of Dr. Nicolaes Tulp". There's a whole load of staircases located around the medical school. This is one that my Dad reckoned I'd like to photograph. He was correct and I'm glad it turned out the way I saw it in my head. A single lamp over a little stone archway. Peeking out of a medical school window onto Teviot Place. A scaffolding on one of the various medical school buildings. Archibald Tait was the Archbishop of Canterbury from 1868 to 1882. This bust of him is tucked away in a little lane within the grounds of the medical school. This is the final shot from my night spent wandering the university, and coincidentally, it was also the final exposure on the roll of film. All in all I'm really happy with how the images turned out and although I enjoyed shooting the digital ones, I'll remember the night as being the night I fell in love with film. On Sunday, Emily, Adam and I went to The Botanic Gardens in Edinburgh. Emily needed headshots done for her portfolio and I badly needed a female presence in my own portfolio, so this was the perfect solution. I think we managed to get some amazing shots and that they are some of the best portraits I've done to date, owed much to Emily being so easy to photograph, The Botanic Gardens being such a nice place to take pictures and Adam always helping with ideas. This first little area was lovely. The way the trees form an archway make it perfect for this type of shot, as do the the way the railings go all the way back, adding to the sense of depth. I also feel that both of these would be lesser shots without the bench being where it is. A trend throughout all these photos is the lovely contrast between Emily's skin tone and her black dress. The following photograph might well be my favourite from the day. I absolutely love it. It required a slight bit of straightening and a tiny change to the contrast but that's it. It was basically perfect straight out the camera. It's almost like Emily is wearing an extravagant decoration in her hair. The natural light is lovely and the matching pink hues of the flower and Emily's lips really add to it. My mind was set on taking portraits (and so were my camera settings) so I wasn't really aiming to take pictures of anything else, but as ever, you end up trying to grab a couple. I quite like how this picture of a little Koi(?) fish turned out. There was just something about the concentric circles made by the little guy that I found appealing. A fantastic photograph? Nah, but one that turned out quite well under the circumstances. Similar can be said for the photo after, not great, but I liked the way it's bushy tail looked. Anyways that was your brief animal interlude, back to Emily! i tried a darker exposure to give this next one a different feel. I kinda like it, nice and moody. All the photos of Emily so far made use of the natural look and colours rendered by the camera with only very minimal adjustments made, which was usually to the contrast or exposure. I love giving photos a certain look, but sometimes they just don't need it. To keep things fresh, and because I felt the following three had more of an urban feel, I decided to go for a different look. I think (read: hope) that it works. The first two, specifically, are all about lines and how they cut through the frame. I'd never had the opportunity to take this kind of shot before so I'm extremely happy that they turned out as I had hoped they would. The third is a closer portrait and it was clear at the time that the lighting in that spot was beautiful. I kept the the same look for it since it was in the same setting and I feel like it, along with the other two, make for a very nice trio of images. This final photo puts all the emphasis on Emily's face and as such is a much tighter crop. I went for muted tones and tried to focus on her eyes. It's little things like the very slight freckling on Emily's nose and cheeks that make the image. I've always been a fan of that type of up close and personal portrait, so I hope I've managed to pull it off. Lastly, thanks to Emily for being a great model (you can see her page on the Model Team website by clicking here) and thanks to both Emily and Adam for a nice day out. Recently, in an effort to practice and hopefully improve my editing, I've been looking back through old photos and trying some new things. It's proved to be a worthwhile exercise and has paid off already with the first two photos in this blog making it into my portfolio. I think it's easy to write off images as sub-par but sometimes certain shots require more work to get them to where you want them to be. That extra work can really be worth it. I was never very sure about this close up of Barns Ness Lighthouse. I like that the stars look like rain but something about it never felt quite right. I think I would have liked it more if the exposure had been longer, as that would have created longer star trails. Nonetheless, I still think it's a decent image, I never used it because I tend to pick one shot of a subject and post it. That's one of the benefits of having a blog now, I can post multiple shots that are similar, which is not something you would normally do with a portfolio. I've always loved that grainy, textured feel of film but never really knew how to mimic it with digital. Fortunately I'm getting better at doing so. This silhouette of Adam with his camera is just one of many photos I've practiced that look on. 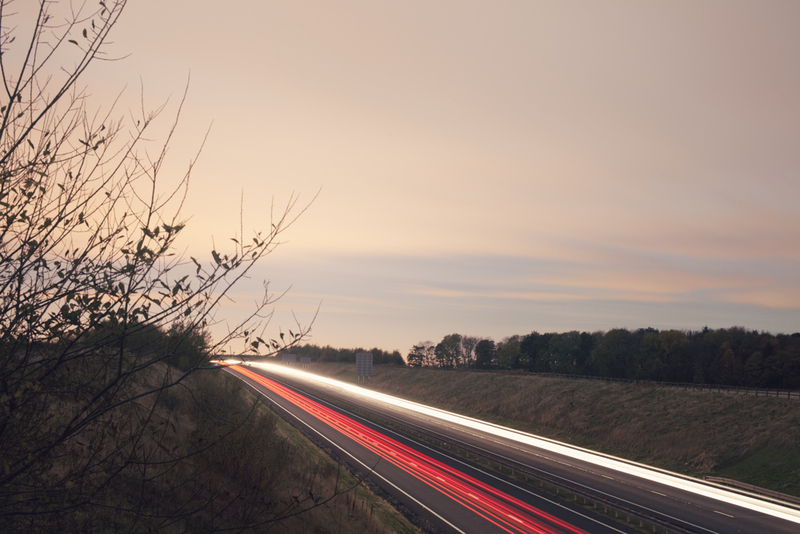 The next two were my first real attempt at doing long exposure car trails. These were taken near Haddington. My favourite one made it into my portfolio but I had a few other useable ones from that night. The first was a little later on and a longer exposure, and as a result has more light, so it feels more like a very early morning shot, whereas the second one faces in the opposite direction and is a more accurate version of how things actually looked. I don't love either of them but they are decent, I think. I'm still undecided about this next one. It's Bass Rock taken from a beautiful secret beach my friend Craig and I found randomly one day. This wasn't in any way useable to begin with but I think I like it now. I could never decide if the slight haze in the sky made the image better or worse. I added a little edge blur to try draw the eyes to the rocks leading to the focal point which is, of course, Bass Rock itself. Many of the images I take fall into this weird middle ground. There's some photos I look at and I know that it has something. Similarly there's photos I look at and I know that they are terrible. The rest fall into the aforementioned middle ground where I have no idea if they are any good. The picture below, and indeed most of the ones in this blog post, are in that category. I like this one of Adam. A slight flare was added to give it a summery feel. This is another one that I may end up using. I tried editing this one a million different ways and could never settle on a look I liked. Furthermore I didn't know if it was interesting enough, I mean it's a gate. I do like the clouds though, and I liked the crooked position of the lock. I eventually settled on this look for it, which I like, but is the image any good? I have no idea. I've probably rambled enough for one post, but the point I wanted to make was that you should revisit old photos because there's a good chance that something that didn't make sense to you at the time, makes sense to you now.